Hi Everyone! Jenny Raulli from Bloom Designs here and I am SO happy to be back on Lil Luna today sharing an inexpensive and easy Halloween Table Backdrop. Honestly I have had the most amazing (almost lazy) summer but there is no better motivator than Halloween to make you want to decorate and celebrate. This Trick or Treat, Something Sweet sign makes an adorable but festive backdrop for any Halloween celebration or use it just to make your home a little more festive. I always start with a black and white color scheme for Halloween tables. There are so many store bought or easy to make desserts the fit this color scheme that its easy to fill a dessert table. I also love it because it’s easy to add in an accent color- think lime, hot pink or apricot- to fit the occasion. Make your desserts more festive by adding little creatures to your table. A dessert table like this can be staged in under a half hour. To print our free Halloween Table Backdrop, click here and choose either black background or white background, shown below. Forward the download to your local printer. Have it printed as a 24″x36″ engineering blueprint (you can do this at any copy place or office supply store) and it only cost about $3. This is a much less expensive way to make a huge black and white print than having a poster made. 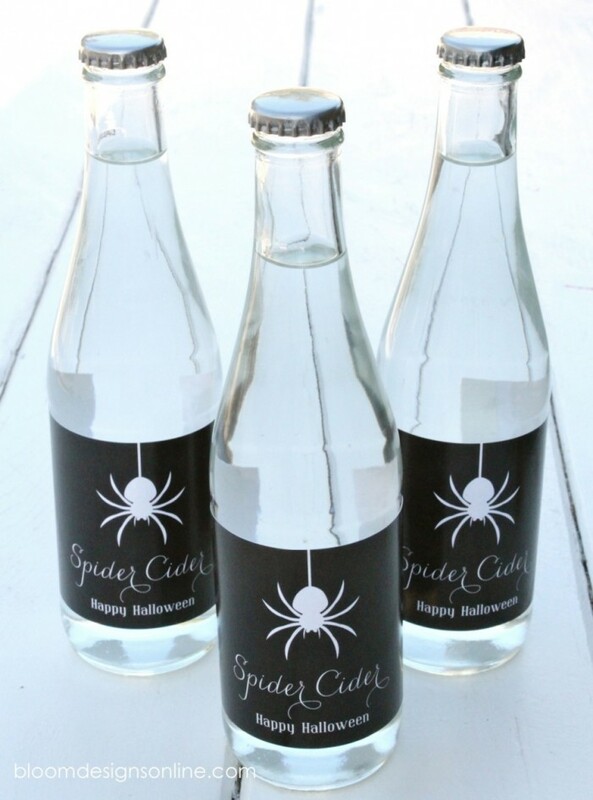 For other printables in this theme and for more Halloween ideas like these Spider Cider Lables, visit Bloom Designs Online or follow me on Instagram! Have a spooktacular season everyone! This is SO cute!! I can’t decide which one I love more – the black or the white background! Thanks for sharing this printable backdrop with us, Jenny! For more amazing prints by her, head over toBloom Designs Online! And for more Halloween prints from here on the site, go HERE. For all things Halloween, go HERE.